What’s the value of a community getting its act together on arson? About £200,000 perhaps? Kings Cross has improved a lot over the last ten to fifteen years – particularly anti-social behaviour. A new set of data has prompted me to have go at estimating how much one aspect of that improvement is ‘worth’, in a way that might help others looking to raise money locally. There’s a new (to me) spreadsheet published by the Cabinet Office on the cash ‘value/cost’ of specific things: from an arrest, to being excluded from school, to arson. It’s designed to help people quantify social impact and pulls a lot of disparate information together in one place – really handy for bid writers. I am sure there are flaws and compromises for people to pick at, but it is a good place to start. 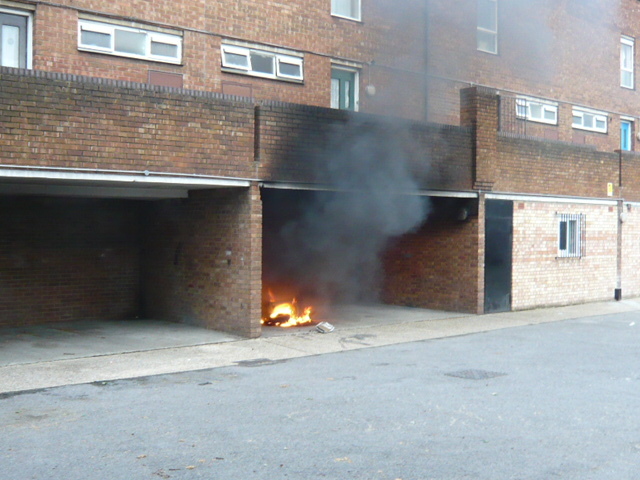 I’ve written several times about the huge reduction in the levels of car fires and other arson around Rufford Street, up in the North part of Kings Cross. Arson fell from a level of more than one a week to less that half that, although still high compared to the rest of Islington. Arson in Caledonian Ward as a whole (most of which, in my view was car fires in the Rufford/Gifford/Bemerton/Outram area) fell sharply due to a wide range of community measures – better youth work especially by CYP and Crumbles, community policing, better housing policies, local people drawing attention to the problems etc etc. Stattos would be welcome to hack away at my numbers – I didn’t use a methodology more elaborate than ‘subtract one number from another then multiply it by a third number’. Mainly because at this level of abstraction I thought more accuracy slightly spurious – I was seeking a rough number. Comments welcome. Data like this is another reminder of how sad it is not to have Phil Jeffries around anymore, who would point our more or less tactfully how i had got it wrong and improve it. This entry was posted in Anti Social Behaviour, Crime etc, Bingfield Park and tagged arson, gifford, outram, rufford, unit cost database. Bookmark the permalink.